Whoa...it's a steam bath out there. Heat + humidity, makes for one sweaty day. Little man and I even went for an early morning walk yesterday, and that didn't stop the sweat from pouring off me. It feels like summer! Now, cranking up the oven for these delicious and healthy muffins, might not sound like the thing to do on a steamy day, but trust me, they are worth it! If you do, make them early in the morning or later at night. Definitely not during the heat of the day. Oh, and before I get to this recipe, I still need some fresh salsa recipes. I'm trying to find the best one - it just may be yours! Heat oven to 400 degrees. Grease muffin pan or liners (I've baked them with and without liners, and both turn out fine). Mix wet ingredients first, then add dry ingredients. Gently fold in berries. Bakes 18-20 minutes and immediately remove from pan. These muffins are moist and a little nutty. You get the crunch of the granola every few bites, along with the juiciness of the blueberry. These look so yummy! I always have Stoneyfield vanilla yogurt, flax seed, and granola on hand so this would be a perfect go-to muffin recipe! I just copied your muffin recipe. It looks awesome. I might make it this week! 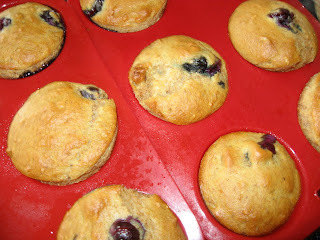 I heart blueberry muffins... but only homemade! This recipe sounds great- and healthy! Thank you so much for sharing the recipe. How do you come up with your recipes? Do you just make them up as you go along or do you give and take from others' recipes?? Curious! 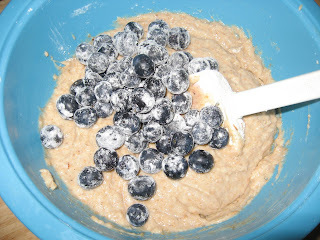 Adding granola is so healthy and gives so much texture to these..yummy! Can I use frozen blueberries?? Here is the link to my sister's best best salsa ever! Adding granola is a great idea! When I started reading the post I thought the flax was going to give the crunch! Perfect in my opinion too! Oh...I'm totally stealing this recipe! It sounds GREAT! I can't wait to make these!